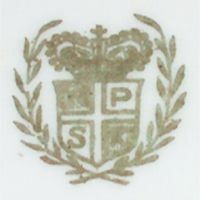 This page was added as there are still many people out there that believe this mark is actually German, which it is definitely not, even if many of the items found out there do not show the typical 'NIPPON' addition. 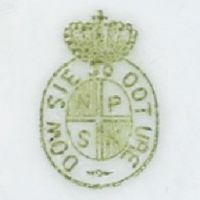 There are various background stories to these marks and all claims containing Noritake are just as made-up as those which base on utter nonsense created to somehow link up the abbreviation N.P.S.K. with other famous factories. In addition there is no commercial form with 'S' except the term for Branch Office (jap. : shiten) which can not be combined with the company designator kaisha and so the combination 'S.K.' in this case can not be a company/business form appendix. Another background story includes the (kiln) manufacturer Shubei (which can also be read as Shuuhei) that normally used impressed kanji marks but was linked up to N.P.S.K. because the impressed kanji mark of Shubei was found on some items that also carry the N.P.S.K. shield mark. But that actually proves nothing as for example every German Rosenthal item could carry some third-party decorator mark, thus the N.P.S.K. markings for example could just as well be simple decoration marks on Shubei items. Anyway: this mark is not German, hence I will not include further info. 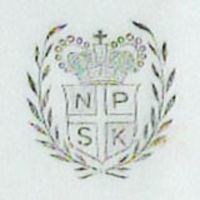 Wreath around quartered shield containing the 'N P S K' initials. Appears 'shorter' than the next one due to the picture angle. Clearer and aspect-ratio correct example of the previous mark. 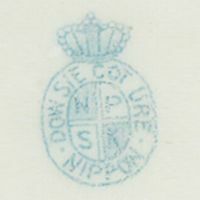 Blue oval mark reading 'DOW SIE COT URE' and 'NIPPON'. Green oval mark reading 'DOW SIE COT URE' with a small '30' at the top.